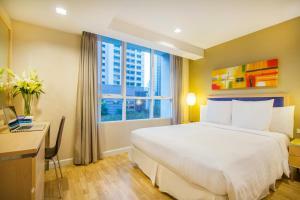 Urbana Langsuan, Bangkok is situated in Bangkok, 800 metres from Central World Plaza. It offers an infinity swimming pool, fitness centre and spacious accommodation. The air-conditioned studios and apartments at Urbanan Langsuan are brightly lit, and come with modern furnishings. They are equipped with a DVD player and flat-screen TV with cable channels. Guests can enjoy a game of tennis, or indulge in a relaxing massage at the spa. The hotel provides car rental services while travel arrangements can be made at the tour desk. Amontre Restaurant serves international dishes, and is available for all-day dining. Urbana Langsuan, Bangkok is 800 metres from Lumpini Park. 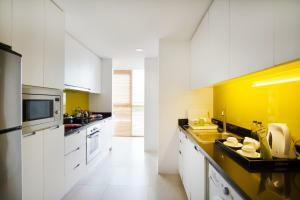 It is 1.6 km from MBK Shopping Mall and an hour's drive from Suvarnabhumi Airport. The hotel offers both non-smoking and smoking rooms. Please indicate your request upon booking. Rate: THB 2470.00 ... THB 18335.00; select dates below to get current rates. Spacious apartment features 2 bedrooms, a separate living area and kitchen. Apartment features a separate living area and kitchen. Features two en suite bathrooms and two private balconies. A kitchen and a dining area are included. Features three en suite bathrooms and two large balconies. A kitchen and a dining area are included.